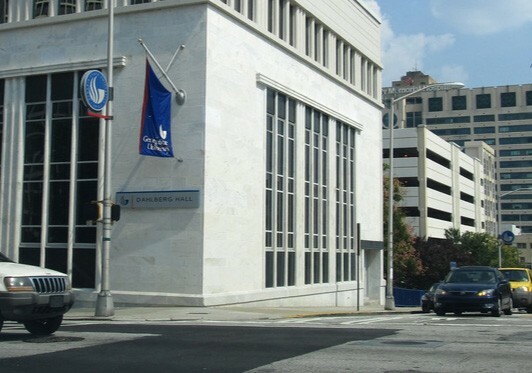 Georgia State University in Atlanta is a state college in an area with some of the country's best known black colleges, which are there mainly because, until the 1960s, Georgia State was segregated. Now the black colleges are looking at Georgia State's innovations to learn how to better serve their own student populations. It feels good to write an unreservedly positive story about education, even if I had to go to Georgia to find it. Even better, the model they use is already in place to a lesser extent in our universities and can be expanded by increasing services and creating a strong high tech tracking system. Georgia State has a student population which is 51 percent black and Hispanic. In 2003 it had a 32 percent graduation rate. The graduation rate has climbed to 54 percent, a substantial improvement. Once the university determines which students are academically at risk, it begins an intensive program of counseling and tutoring to keep them in school. The students attend a seven week summer session before they begin classes where they have a chance to get to know the campus while they learn about the tutoring, advising and financial literacy programs. Each student has an advisor. Once classes start, the college has as many as 800 alerts which can be warning signs the student is beginning to experience problems. Advisors call, email and meet with students on a regular basis, and address problems quickly as they arise. Then there are the minor financial problems which can derail a low income student, the kind of problems a more affluent student can solve at the ATM or with a call home to parents. The university gives students microgrants — not loans, grants — which can amount to as much as a few hundred dollars at a time. What may sound like a giveaway turns out to be a way to stop students from dropping out over small financial setbacks, and it provides a psychological boost which says, "This is how much we care about you and want you to stay in school." Nothing fancy. Just a way to give students the support they need in an environment which can be foreign to minority students' experiences. And it's clearly working. It takes a bit of extra effort and expenditure on the part of the university, but increasing the graduation rate of poor and minority students is a critical problem in our colleges and universities, and the Georgia State method looks like a good place to start. A Graduation Rates Extra: A study just released by the Pell Institute, Indicators of Higher Education Equity in the United States, is filled with stats relating to college enrollment, family income, financial aid and graduation. The percent of college students who attain a bachelors degree within a 6 year period ranges from 59 percent for students from families in the highest income quartile to 26 percent for students with families in the lowest quartile. If you only include 4 year colleges, the number increases to about 64 percent for high income and 48 percent for low income students. Another fascinating stat is the difference in graduation rates of students from families with the same basic income depending on whether one or more parents went to college. The percent of students graduating from a four year college whose parents are in the lowest income quartile jumps 15 percent if a parent attended college, from 41 to 56 percent percent. For students whose parents are in the highest income quartile, the number jumps 19 percent, from 54 to 73 percent.